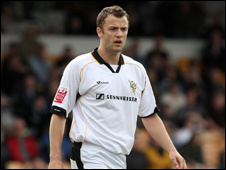 Port Vale striker Kyle Perry has praised manager Lee Sinnott for rescuing his career. Sinnott brought Perry to Vale Park from Chasetown in January after he helped the Southern League Division One side knock the Valiants out of the FA Cup. The 22-year-old told BBC Radio Stoke: "He saw my ability and believed in me so I can't thank him enough for that. "He pulled me back into league football and saved my career. What he's doing for the club is fantastic." A forward by trade, Perry has been asked to play on the left of midfield on occasions and, although he would prefer to play up front, he is happy to play anywhere. "I can compete in both positions," he said. "I'm put out there because I'm tall and I can whip a ball in when I get the chance. "I do prefer attack but I'm happy to play anywhere as long as I'm on the pitch." After starting with a win at Luton on the first day, Vale will travel to Dagenham and Redbridge this weekend looking to bounce back from last Saturday's surprise home defeat to Accrington Stanley. But Perry insists that Sinnott's rebuilt team still need time to knit together. "You wouldn't think it by the way we've been playing," he said, "but you have to remember that we're still a new squad. "We're working hard in training and looking to build on what we've already done."